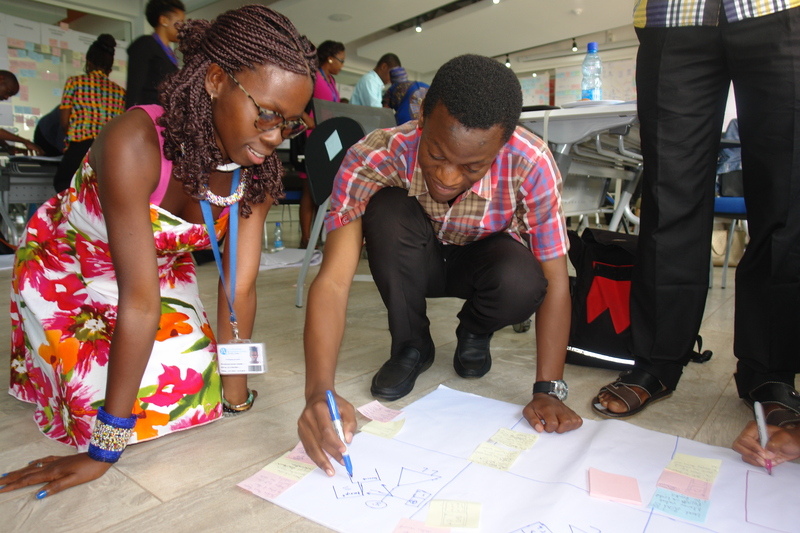 In the summer of 2015 at Dartmouth College I embarked on a new adventure: teaching a group of young African entrepreneurs how to use human-centered design to innovate and launch new enterprises. I call this course Design Driven Entrepreneurship. In the past year I’ve commuted to Kenyatta University in Nairobi to broaden this work and make it accessible to a larger number of young East Africans. It is a joy to take part in work that has had such an immediate impact and is also amazingly fun. 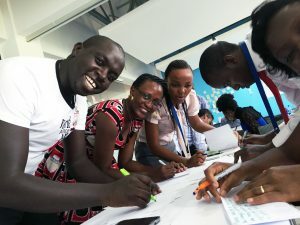 The structure for this effort came out of President Obama’s Young African Leaders Initiative (YALI) that brought 500 of Africa’s brightest stars to the U.S. and placed them at 20 American universities. These Mandela Fellows take intensive courses in one of three areas: public management, civic leadership, or business and entrepreneurship. I teach the latter. After two years, Obama announced that the U.S. was expanding the program by opening four regional learning centers in Africa. 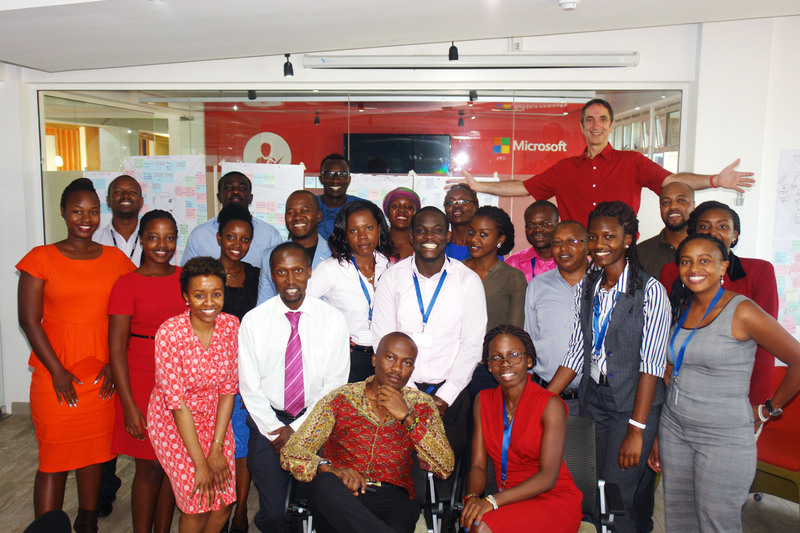 The YALI East Africa Regional Learning Center in Nairobi, Kenya, was the first one to launch. In the summer, I meet with young people from all over Sub-Saharan Africa. In Kenya, I meet East Africans from Kenya, Uganda, Tanzania, Rwanda, Central African Republic, Congo, Somaliland, Djibouti and Ethiopia. They are engineers, computer scientists, lawyers, policy makers, NGO executives, financial experts and others. Their entrepreneurial dreams bind them together. The passion, generosity, and humanity of these young entrepreneurs is infectious. The strive to act as present and future leaders. They embrace the newness, the intensity, and the mess of human-centered design, or “design thinking.” Although it is out of their comfort zone, they show a huge amount of curiosity and bravery. They jump into the experiential learning we provide. It is often the opposite of methods they’ve learned in their sometimes lengthy academic experiences. I try to teach, coach, and inspire them to focus on people and the problems they have. We practice human-centered design techniques and tools. We use Strategyzer’s business model canvas as the base to create new startups or NGOs. The tools are great but the course is not about the tools. It’s not about filling in the blanks; it’s about designing for meaning. The biggest “aha” moment for these entrepreneurs is the shift in perspective from “starting a business” to solving another person’s problem. Many students have an ingrained picture of the successful African businessman (usually a man, usually an authority, usually someone who is financially well off). This image is so powerful and pervasive that I get a number of students each time whose goal is to become “a businessman.” It almost doesn’t matter what the business is. They want to buy into that picture. Usually after the first or second day, they leave the classroom with a new mindset. This isn’t always easy for them. At the end of the week’s session, one student admitted that she thought she had come into class with a “fully baked cookie of an idea,” but that she was leaving with a crumb. Rather than being despondent, she said that the remaining crumb was far more delicious than her original cookie. All of this work happens in collaboration with Dartmouth’s Dickey Center for International Understanding. They’ve hosted the summer Mandela Fellows for the past two years. They’ve created a robust program for the visiting fellows, which includes high-ropes courses with the Dartmouth Outing Club, design thinking with the Thayer School of Engineering, and an outstanding leadership program through the Rockefeller Center of Public Policy at Dartmouth. Our effort in Africa is through Dickey as well. The brilliance in their approach is through their focus on experiential learning and, my words, disrupting the status quo. 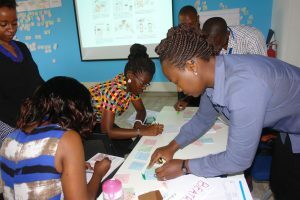 I think one of the key elements that make my Design Driven Entrepreneurship class so exciting for the participants is that it urges people to challenge the status quo in Africa. They are ready for the challenge. I admit that I have a lot to work with. I meet with entrepreneurs, like George, who is trying to create an entirely new funding system for startups and small businesses. Joel is working on improving sanitation in Uganda through public toilets and turning waste into electricity. Yvette is working on providing drinking water in Rwanda. Collins is working on systems for increasing sustainable farming. Daisy is working on affordable solar power in Eastern Africa. And Jamila is turning young women into self-sustaining entrepreneurs using the tools she’s learned and used in my class. I’m really not doing all of my students justice, because these are just a few select examples of all of the impressive work done by these young leaders. Fortunately, I get to continue on after the YALI program ends, providing any encouragement, guidance, and connections I can. Just last month, one of my students in Addis Ababa told me he had to jump ahead in the curriculum because he was trying to win a startup competition. 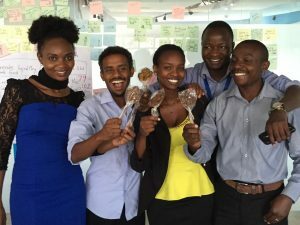 After a flurry of emails with pitch deck revisions, Henok’s Mak Addis Tutors company was selected as one of three Startuppers of the Year for Ethiopia. Fun stuff! Idea sprint winners enjoy their VT Maple lollipops. So what is Design Driven Entrepreneurship, anyway? I’ll start by telling you what it’s not. Many of the students I see come in expecting that they will learn how to create a business plan. After all, that’s what everyone tells them new businesses need: a plan. They expect that we will focus much of our time on entrepreneurial finance and even bookkeeping. They want to know what documents they need to create in order to raise money for their idea. But that’s not what I teach. I’m not saying those skills aren’t important. At certain points, it’s critical for people to have them. Instead I focus on helping budding leaders to create a business model built upon ideas that solve people’s needs and that have a unique place in the market. The way to come up with innovative ideas is to become customer obsessed. And the way to get there is through human-centered design. Commonly, these entrepreneurs haven’t spent a lot of time with people who will use or buy their services. In that sense, they are not much different from American entrepreneurs and business people. I want them to find ways of asking better questions, both of themselves and their partners as well as prospective customers. I want them, most of all, to question their many assumptions. This isn’t easy and it doesn’t always work. At the end of every class, a small number of participants say they we didn’t show them where the money is. Or that we didn’t practice balance sheets. To be honest, we do have much of that material online. But some would feel more comfortable following a traditional business curriculum. Ultimately we want to measure the effect of this experience by looking at the results of these new startups. But I have a smaller metric I’m constantly paying attention to. I want to know if the students in the class share this new knowledge in any tangible way. So I ask, and ask, and ask. Here’s what I find: they share the tools, techniques, and approaches immediately. Some of them share with other YALI students in the public management or civic leadership tracks while they’re still in the program. Some of them take the experience back home and start doing information sharing and small workshops with their co-workers or startup partners. One or two are even working on starting their own human-centered design consultancies for other entrepreneurs. In Kenya, part of the work entails capacity building for the YALI Regional Learning Center. 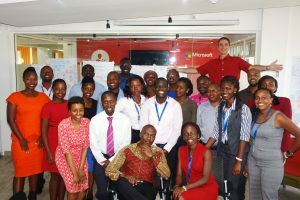 Over the winter, my Dartmouth team and me trained a group of seven Kenyans to run the Design Driven Entrepreneurship class once we’ve left. While we’ve finished our work training, we also realize that this is an ongoing experiment: we’re asking people to teach something new in a new way. Through it all, this is first and foremost about people, as much about the people learning and teaching as about the customers. Mariatheresa and Ebby, Kraus and Jackie, Alex and James, Phionah and Sheillah, Peter, Wahida, Sue, and all the others. To top it off, I’ve had Lorie Loeb of the Dartmouth DALI Lab come and teach presentation and pitch deck skills. She is one amazing designer and teacher. Amy Newcomb is my anchor and rock at Dickey; she makes everything run smoothly, networks incredibly, and always has a smile on her face. 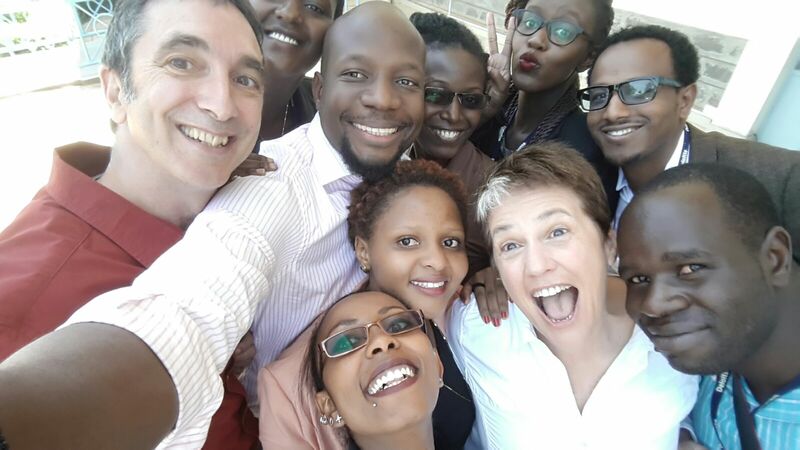 David and Francis at YALI manage the seemingly never-ending influx of new cohort students. I can’t wait to see what happens to these young African leaders. I can’t wait to see what happens to Africa once these young women and men start having an impact and influence on life and society there. Make no mistake: they are up against some big obstacles. I have no doubt that many of them shall succeed. 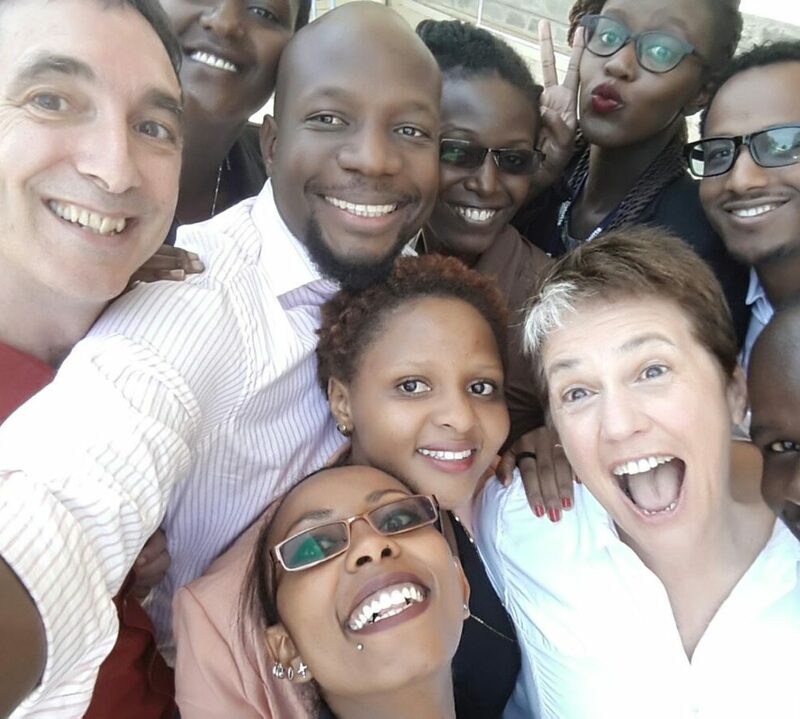 Cohort 4, and teaching assistants, at the YALI RLC at Kenyatta University in Nairobi, Kenya.